This is a great recipe for long winter days, or even summertime, when you don’t want to mess with the grill. Of course you can also do it over coals, but don’t add the sauce until the last 15 minutes, or it’ll burn in an unpleasant way. 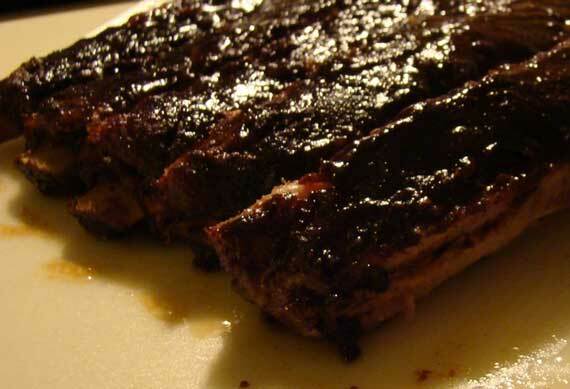 Rub the five-spice powder on all surfaces of the ribs, and season with salt and pepper. Lay ribs in a single layer on shallow roasting pan (I use a sheet pan), greased or lined with greased heavy-duty foil (for easier cleaning). Put pans in oven to slow-roast for 2 1/2 hours or maybe a bit more if you’ve doubled the recipe, as I often do. Whisk above all together in a saucepan, and simmer slowly, stirring, until somewhat thickened, at least 20 minutes. Taste for sweet/sour balance. May need more sweetener. Set aside. After the ribs have roasted 2 hrs, remove the pan. Dip the garlic and ginger chunks out of the sauce and baste the meat with the sauce. Tuck the meat back in the oven. After 15 minutes, baste the ribs again, and roast for another 15 mins. When the meat is beginning to separate from the bones, remove from the oven. Let them rest a few minutes, then separate them with a heavy knife or cleaver, pile them on a serving platter, then sprinkle with the onions and cilantro. Feast!